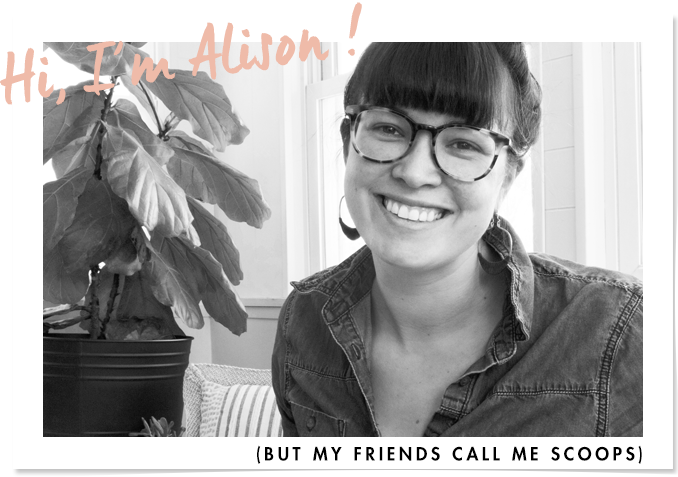 If you’re familiar with the blog, you might recognize the garden picture below. 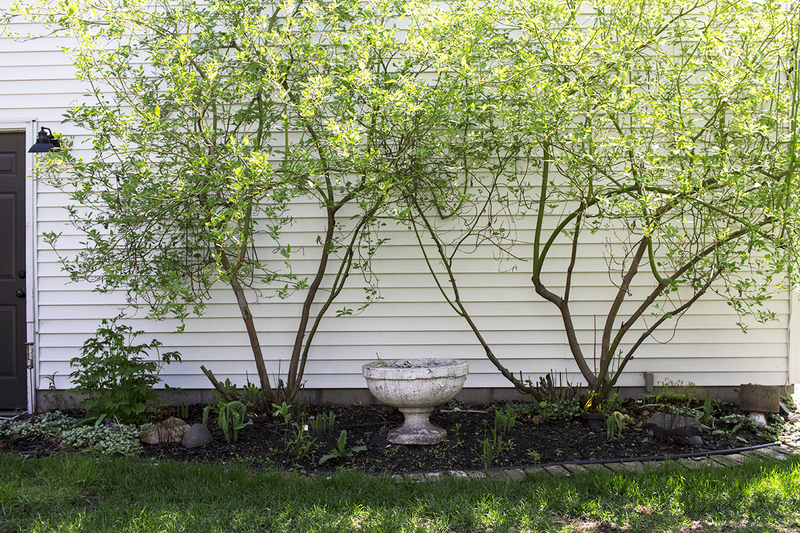 This is the most sloppy garden in our backyard – there’s always one that you kinda neglect. I’ve been slowly filling in the base of the garden with “leftover” perennials for the last few years – by leftover I mean things that I have divided and stuck in here all willy-nilly-like. There are a lot of Hostas, a few Maiden Hair Ferns and some purple Lamium for ground cover. I like the texture of all the leaves but it is a lot of green leafs, and it’s looking like too much of the same thing. I like the idea of this garden being dedicated mainly to leafy perennials that aren’t as showy as their colorful flowering counterparts. I think a subtle break at the end of our more vibrant sun garden would be a nice contrast, and since this spot gets shade in the morning and early afternoon, partial sun in the afternoon, and full sun in the evenings, I think it would be an ideal location to try such an leafy endeavor. My go-to for adding color to this garden in the past has been the urn that sits right in the middle of of the small garden. My usual efforts involve cramming that urn full of annuals, watch it spill over and calling it a day. This year I’m ready to invest in a little perennial color! I’m sure a lot of you are familiar with Hostas, they are everywhere because they are easy to grow and offer a lot of texture, variations and variegations. 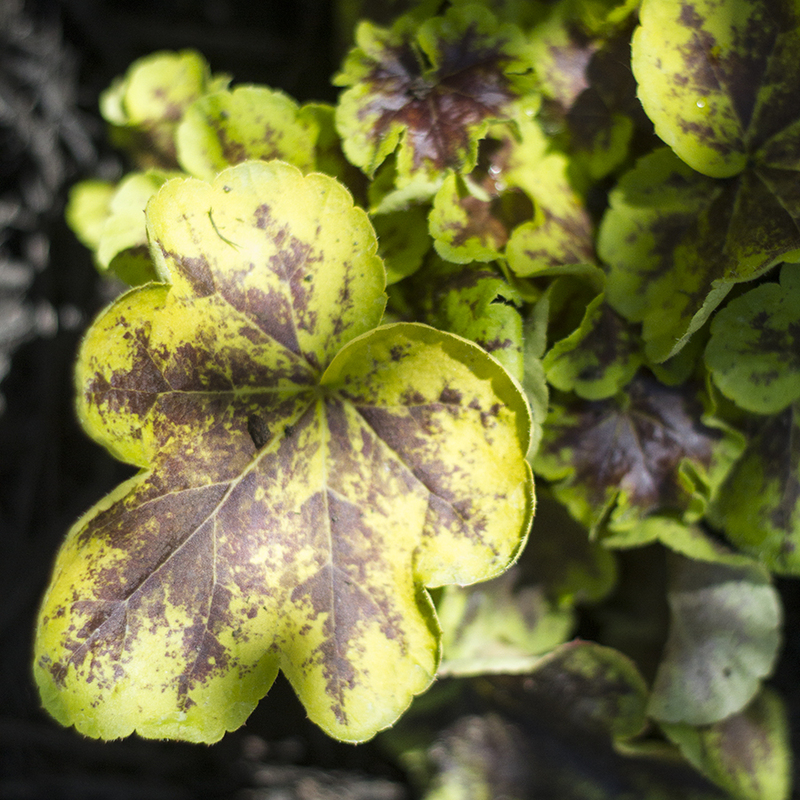 Howevs, there is a new leafy wonder in town called the Heuchera or “Coral Bell”. Although the shape of the leaves aren’t as minimal as the Hosta, the colors are pretty amazing. It’s a mostly leafy plant that produces fine, dainty flowers in the late summer, the leaves are the star of the show. Many have an underbelly that is a shade darker than the topside of the leaf so when they blow in the wind they look kinda awesome. When Monrovia asked if I’d like to chat about their plants when it came to adding color to my garden, I was like “Duh, do you know who you’re talking to? 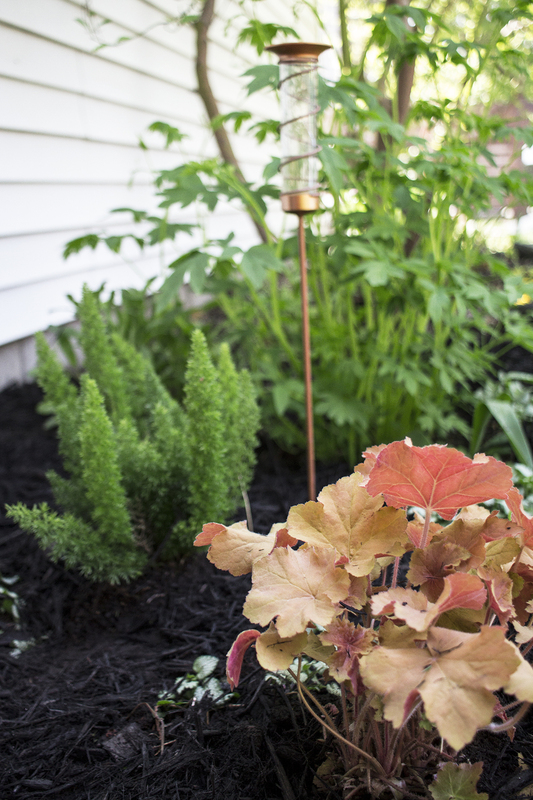 I’d love to!” This seemed like the perfect opportunity to fill my garden in with a little more leafy plant color (and a fern for good measure), share with you guys my favorite alternative to the hosta, and drop a bit of planting knowledge. 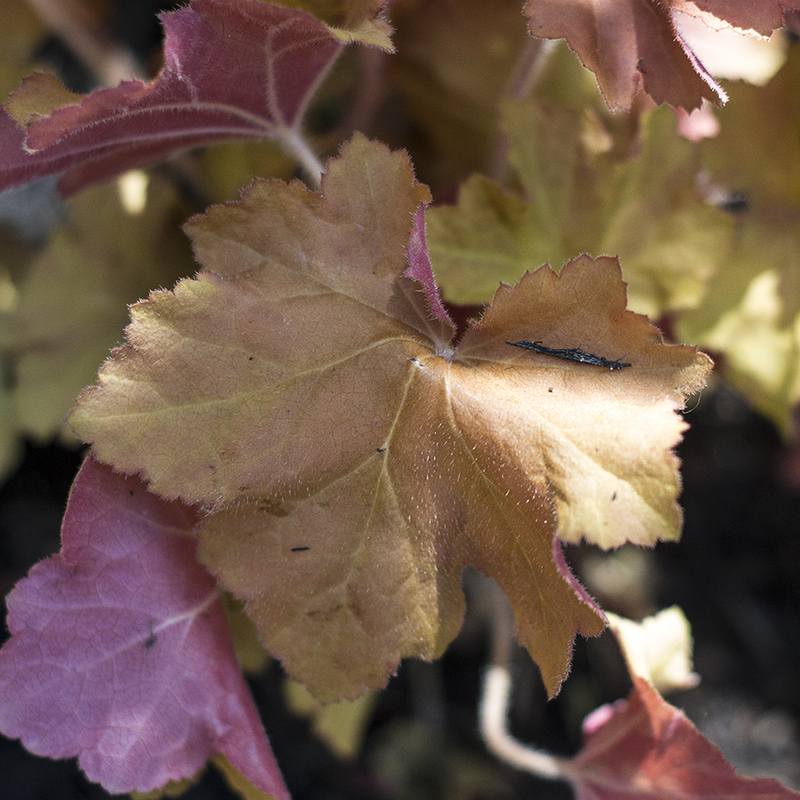 I’d encourage all of you guys who are a little nervous about gardening to try growing a few Heucheras. 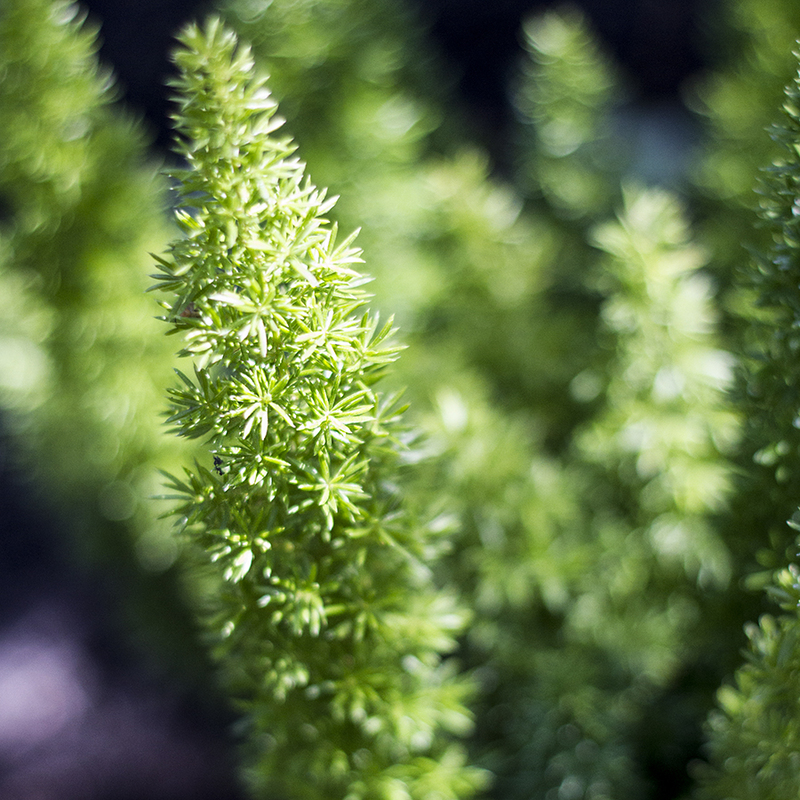 They are pretty resilient and offer a lot of subtle color and texture to any garden or flower pot. I’m a fan of Monrovia for realz and heres why. Monrovia offers a quality product, it’s obvious. Just go to a Lowes or local nursery and you can see the difference between Monrovia brand plants and others. The plants just look better, are larger and stronger. Monrovia has a huge variety of hard to find plants, just check their website. They can ship anything you see on their online store to a local garden center for you. My mom just did this last week when she was needing more Southern Comfort Heuchera and couldn’t find it anywhere. Monrovia had the plants shipped to her local nursery and she had them in her garden within a week. 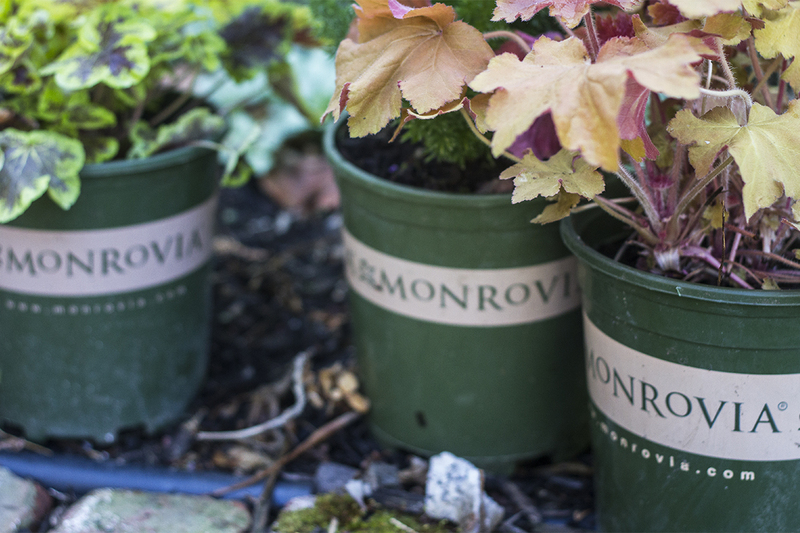 For all you guys that are feeling overwhelmed by gardening, Monrovia offers a plant finder. 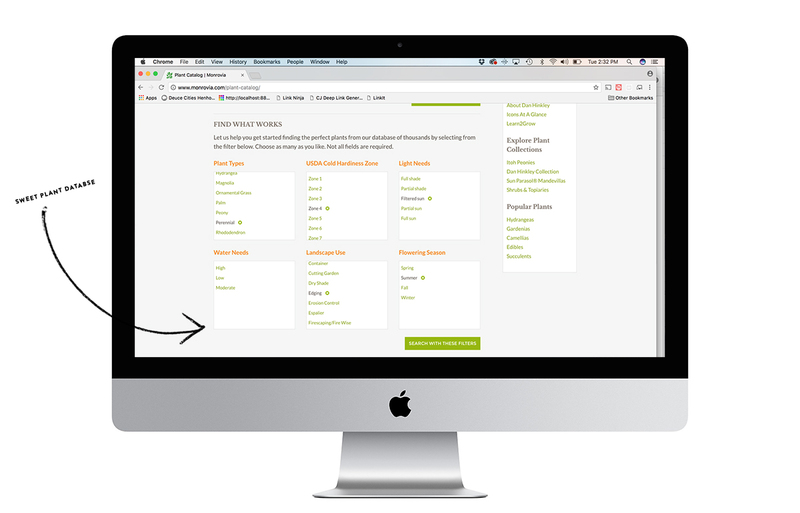 Just enter your info into their database and it will come up with a list of plants that will work well in your location and zone. 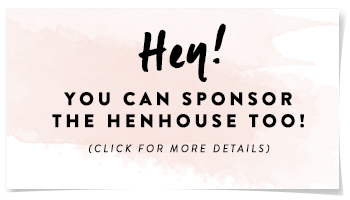 I use it when I’m out shopping – no lie. Pretty great huh? I’m a big fan and it helps make planning much easier and less overwhelming. 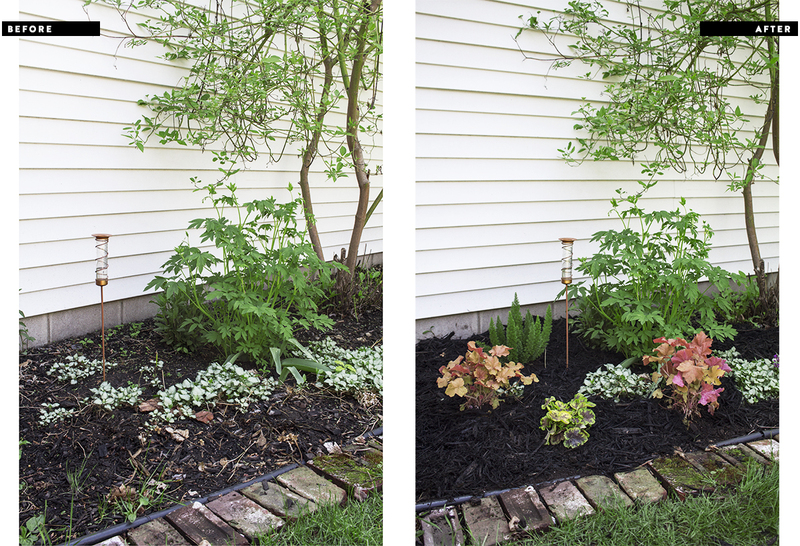 Steps for planting stuff in the dirt (aka your flower bed). This may seem obvious but there is are a few things you can do to make a great hole for your new perennial. 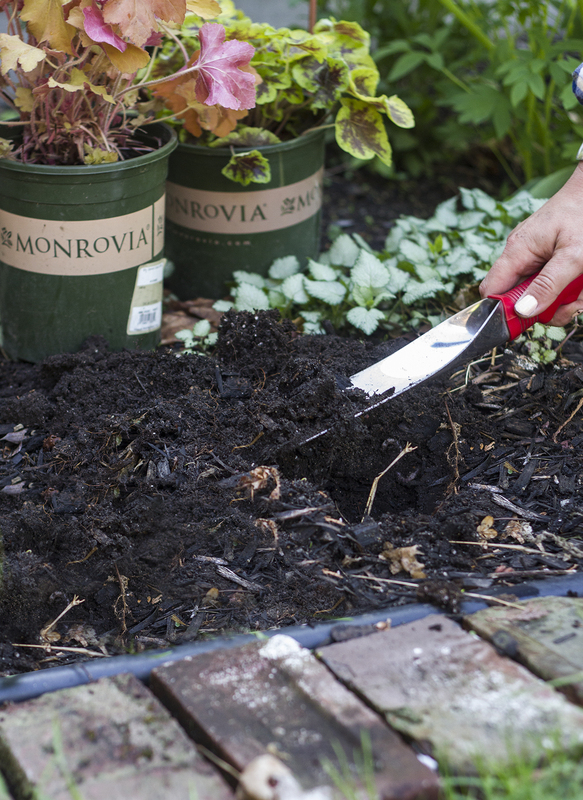 First start by digging up the soil and removing debris like roots or rocks. I like to place the soil on a tarp while You can do this by easily digging a hole with a shovel and turning the soil over. Next you’ll want to remove the soil from the hole. 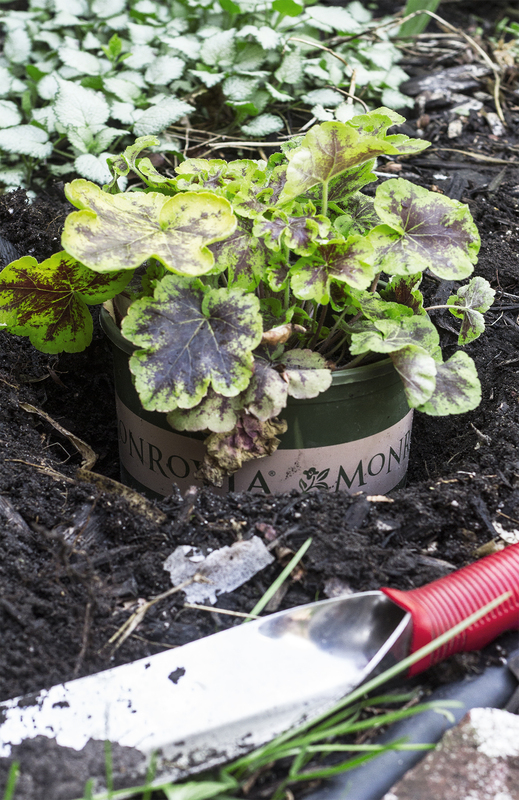 A good rule of thumb is to dig the hole twice as wide as the container and equally as deep so that the new plant will sit flush with the ground around it. Gently remove the plant from the container. I like to grab the plant by the base with one hand and then wiggle it out of it’s pot. 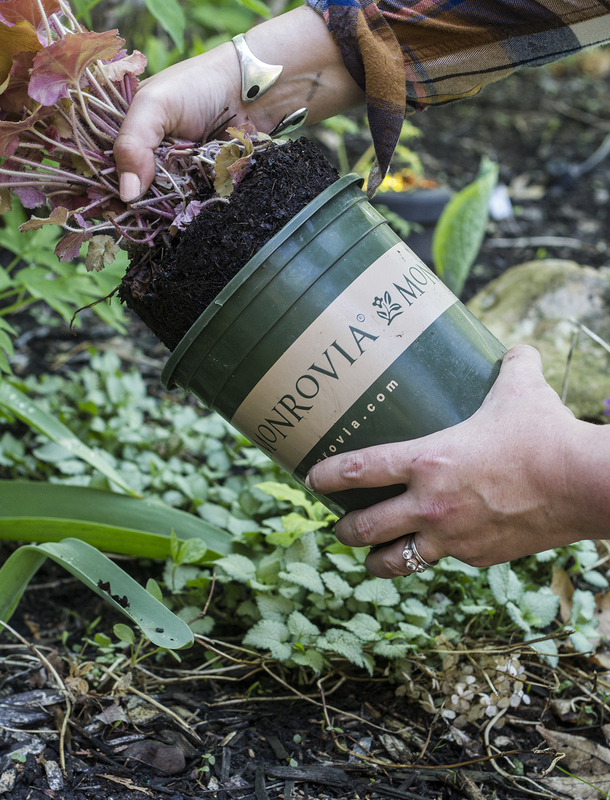 If it doesn’t want to come out of the pot, take utility night to slice the plastic pot open and remove the plant. 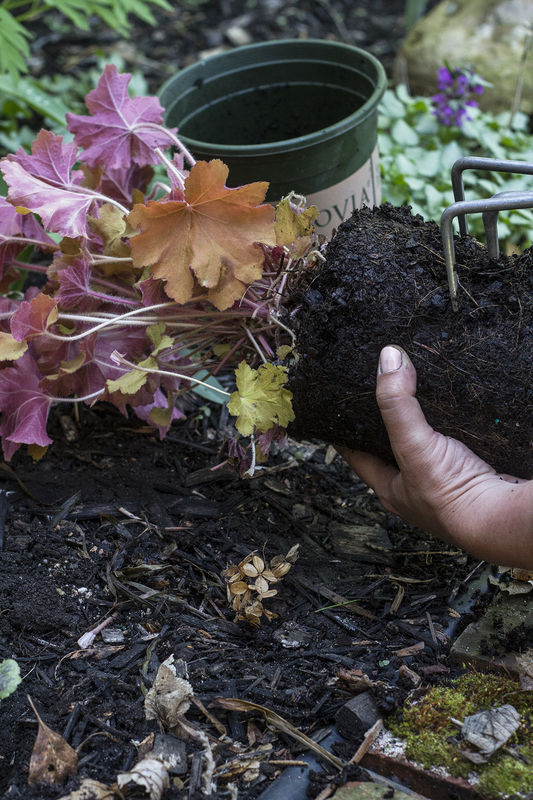 Take a hand rake to loosen the root ball and break up the soil at the bottom of the hole. This new perennial is going to need food to grow! Add some controlled release granular fertilizer or manure to in the hole with the plant. Backfill the hole with the soil and press down around the base of the plant. Make sure you give your plant lots of water over the next few days, I often will set a timer and leave a slow hose on the plant for 15 minutes after planting and repeat this for the next few days. 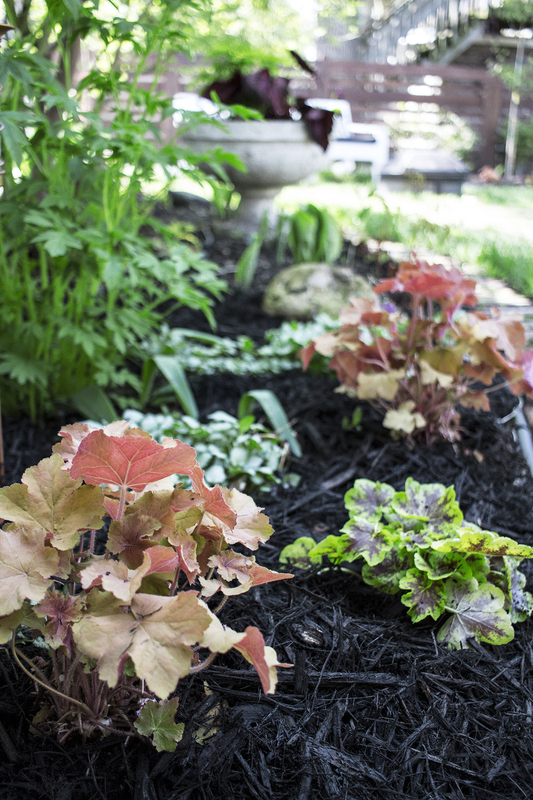 Mulch is key to keeping plants safe and happy during the summer months. 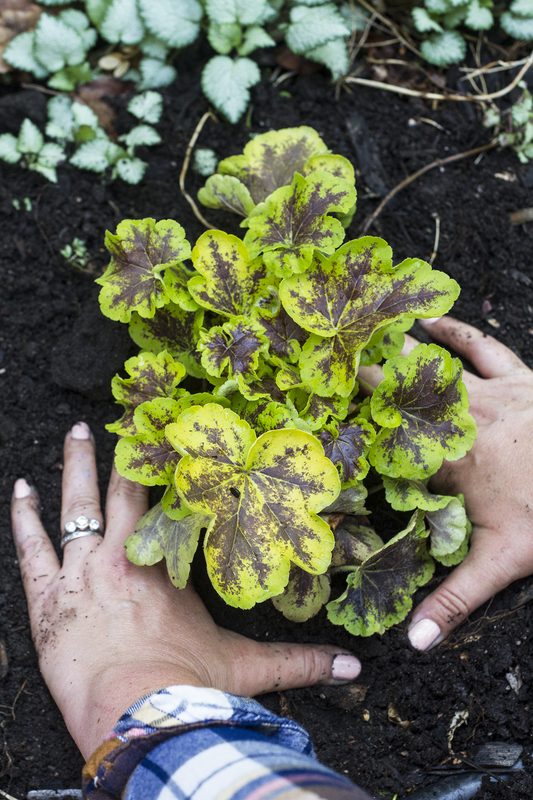 The mulch protects the roots from the sun, and helps to retain water and keep the plants cool(er) in the summer. 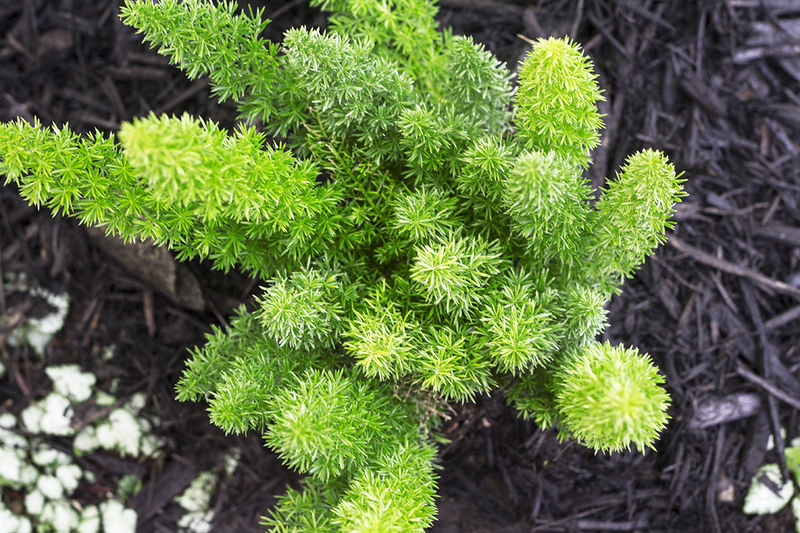 There are a few perennials that prefer not to be mulched around the base, like peonies and sedum. Double check your type before mulchin’! Dramatic Foliage Color, Blooms in Summer. 10-14 inches tall, 18 inches wide. 2-3 feet tall, 2 feet wide. Partial Shade to Partial Sun. 10 inch tall mounds, 16 inches wide. Love it! Took your advice from the other day (on the foundation garden) about Tonkadale Greenhouse and went last night. Oh my heavens their selection is to die for! I went a little nuts buying all the things, but it’s great. My MIL (a garden expert) gave the go ahead to plant the perennials but said to hold off on all my annuals. SO hard. When do you put your annuals in? My MIL said this weekend would be fine IF the 10 day forecast was warm….just wanted to hear your thoughts. Thanks for the inspiration. I dont comment often but I’ve been closely following your garden for years (since we’re in the same area) and trying to mimic lots of what you do. It’s finallly coming together! Anyways, I’m planting on a buttload of annuals on Saturday so you should follow my lead and feel free to go for it! YESSS!!!! I’m doing it then! I admire your garden so much! Any gardening blogs you follow that you’d recommend?